Are you visiting the Englewood area? Or are you a local looking to get away from the daily grind? Spending time on the water in a rental boat from Abe’s is the perfect way to unwind and rediscover your lust for adventure. This center console fishing boat comes equipped with all the features and comforts you need for angling, exploration and leisure. 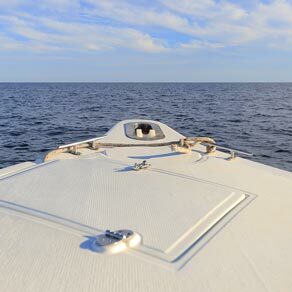 The boat has multiple rod holders, a live well, and plentiful storage compartments for your fishing and beach gear. Let the F225 Yamaha 4-stroke engine take you gliding through the Intracoastal Waterway and the Gulf of Mexico, surrounded by the beauty of Florida nature, as you employ the included GPS, charts and maps to navigate to isolated islands, pristine beaches and prime fishing spots. Seating up to 8 people with comfortable upholstered seats and a T-Top roof for sun protection, the Scout 235 can accommodate the whole family – or a group of your fun-loving friends. Reserve the Scout 235 Sportfish today – it’s the easy way to get away!